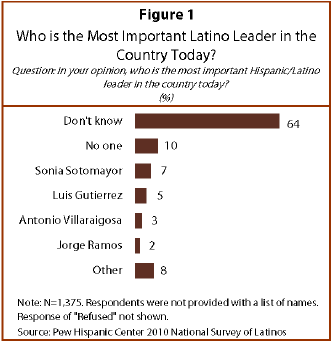 No one else was named by more than 1% of respondents in the 2010 National Survey of Latinos conducted August 17 through September 19, 2010, by landline and cellular telephone. The margin of error for the full sample is plus or minus 3.3 percentage points at the 95% confidence level. For a full description of the survey methodology, see Appendix A. But there are often times when groups—be they ethnic, racial or political—do not have easily identifiable leaders. For example, in a national survey conducted after this month’s mid-term elections, when Republicans were asked who they think of as the leader of the Republican Party these days, 45% said they don’t know and 13% said that “nobody” leads the party (Pew Research Center for the People & the Press, 2010). 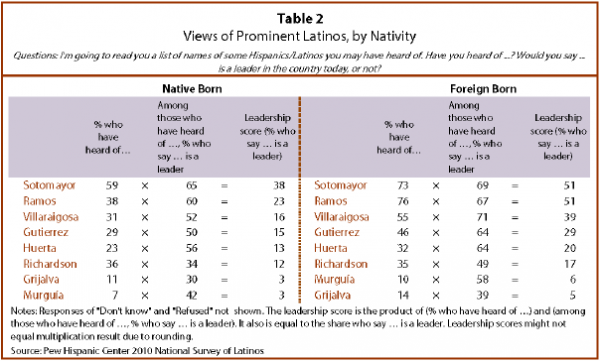 Today, not only are most Latinos unable to name anyone they consider a national leader, but many see divisions within the Latino community between the native-born and foreign-born. About half (45%) say they believe that immigrant Latinos and native-born Latinos are working together to achieve common political goals, but a nearly identical share (46%) say they do not believe these two groups are working together (Lopez, Morin and Taylor, 2010). Both the native born3 (who comprise 47% of the adult population of Latinos) and the foreign born (who comprise 53%) are also roughly equally divided on this question. Sonia Sotomayor is an Associate Justice of the Supreme Court of the United States. Jorge Ramos is an anchor on Univision’s Noticiero Univision, a national evening news show. Antonio Villaraigosa is the mayor of Los Angeles, Calif.
U.S. Rep. Luis Gutierrez (D) represents Illinois’ 4th Congressional District. He currently serves as chair of the Democratic Caucus Immigration Task Force. Dolores Huerta is co-founder of the United Farm Workers of America. Bill Richardson is the governor of the state of New Mexico. U.S. Rep. Raúl Grijalva (D) represents Arizona’s 7th Congressional District. Janet Murguía is the President and Chief Executive Officer of the National Council of La Raza (NCLR), a Hispanic civil rights and advocacy organization. 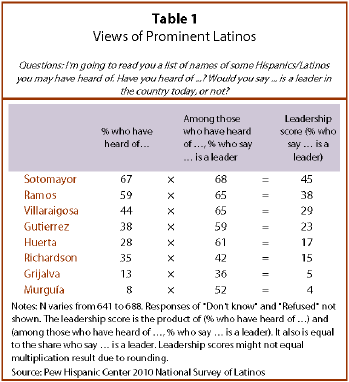 Of the eight names presented (see box), just two were familiar to a majority of respondents: Sotomayor (67%) and Ramos (59%). Four others were known by more than a quarter of respondents: Villaraigosa (44%), Gutierrez (38%), New Mexico Governor Bill Richardson (35%), and UFW co-founder Dolores Huerta (28%). The other two were familiar to only a small share of respondents: U.S. Rep. Raúl Grijalva (D-AZ) of Tucson, Arizona (13%), and Janet Murguía, President and Chief Executive Officer of the National Council of La Raza (8%). For the most part, immigrant Latinos are more familiar than native-born Latinos are with the names of persons presented in the survey. For example, nearly three-in-four (73%) of the foreign born said they have heard of Sotomayor, while just 59% of the native born said the same. And more than half (55%) of the foreign born have heard of Villaraigosa, while just three-in-ten (31%) of the native born said the same. Only in the case of Richardson are the foreign born and the native born equally likely to have heard of him—35% and 36% respectively.